THE "MUSIC TO SPAZZ BY" will bring in Norton Records queenpin Miriam Linna and radio legend (and long time Hasil Adkins acolyte) Jim "The Hound" Marshall at about 10 PM to gab about Hasil with host Dave the Spazz. Tune in for unissued mayhem and true tales about the undisputed king of the one man bands from the nuts who knew him! 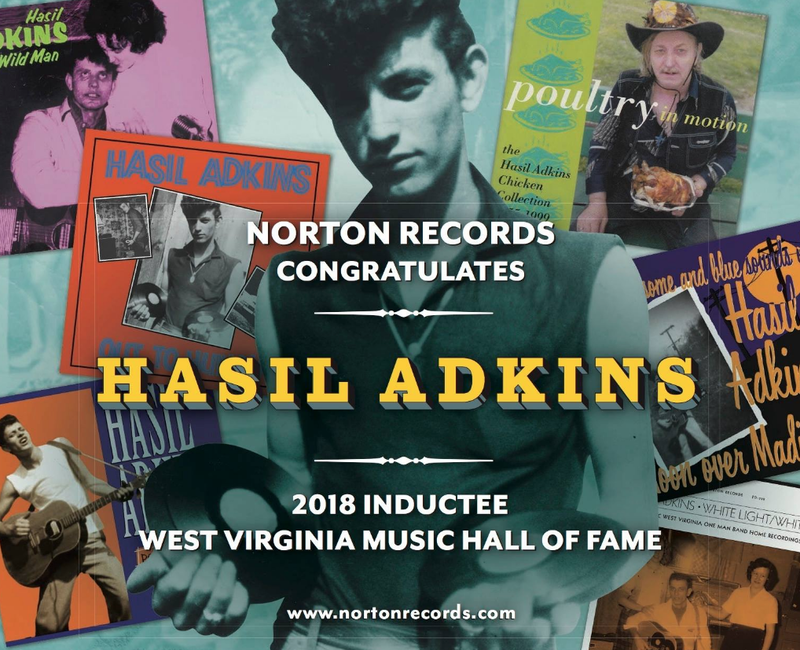 Hasil Adkins will be inducted into the West Virginia Music Hall of Fame in Charleston, West Virginia on Saturday, February 10 at a ceremony and celebration that will not soon be forgotten. Meet you there! Catch all of the Haze's chicken scratch at the Norton site! Dave Marsh at Sirius Hosts Miriam and Sam - NEW RECORD SNEAK SPIN! Kick Out the Jams With Dave Marsh! Dave hosts the pair behind the Nobody's Baby LP + sneak spins their new single due May 5! Ex-teenager and Creem magazine editor/mastermind (among other things) DAVE MARSH gives the upcoming new single THE HAND DONT FIT THE GLOVE by that Kicks girl Miriam its world premier spin... and digs it the most! Dave hosts the gal and maestro producer cat Sam Elwitt in a fast moving yap about the NOBODY'S BABY album and about the upcoming footlong, too, sharing a three part fan fest over the Shangri-Las, the Ramones, the MC5 (natch! ), Reparata and the Delrons, and much more! Dave digs into the I FOUGHT THE LAW book, too-- this total blast that will air twice- Sunday at 10 AM EST and again Sunday midnight into Monday morning. Subscribers tune in 10 AM Sunday at SiriusXM Channel 28 ("The Spectrum") and transistor types can actually tune in for free for this action packed episode! Pick up THDFTG at the WFMU Record Fair ON MAY 1-2-3 where advance copies will be available of all the new Norton releases. It is rumored that the artist known as Miriam may be performing in person at the fair on the live radio broadcast with top DJ Todd-O-Phonic Todd! This relentless quest to conquer radio in all its fabulous formats continues! DECEMBER 4-5-6 Norton Records kicks off the holiday season with a wild weekend of Kicks, flicks, and astounding rock 'n' roll. THREE BIG NIGHTS OF LOUD SOUND ROCK N’ ROLL ACTION! Friday night is our night to howl! A giant six-gun salute with a half dozen top Norton wild men topped off with the wild sounds of the BOBBY FULLER FOUR as served up by (who else?) the RANDY FULLER FOUR! Norton Records has long championed the musical legacy of Bobby Fuller and early El Paso rock n’ roll. Now, Bobby’s brother Randy Fuller (original Bobby Fuller Four bass player) and original hit disc BF4 drummer Dewayne Quirico serve up the best of the Bobby Fuller Four with Norton stringbusters Deke Dickerson and Sam Elwitt on guitars! Get ready to make those floor boards jump! Dig our hero ANDY SHERNOFF as he brings his show (and tell!) to the big stage with his hand-picked band of Norton all-stars delivering the goods! Rumble to the mayhem of the A-Bones! Tremble to the blues wail of DADDY LONG LEGS! Shiver ya timbers to the rompacious MIRIAM and her terrific NOBODY'S BABIES! Watch BLOODSHOT BILL astound as the loud sound abounds! Everyone is on tap for signing and snaps at this fabulous show! Pick up all their Norton releases and the new Kicks publication of I FOUGHT THE LAW plus stacks of Norton wax at the Bell House show! See you there! Randy Fuller Four The backbeat of the Bobby Fuller Four was, and always will be, their legendary rhythm section—Randy Fuller and Dewayne Quirico, bass and drums respectively! Now, the guys hit the big stage at the Bell House with guitar cats Deke Dickerson and Sam Elwitt in tow. Don’t miss celebrating the publication of I FOUGHT THE LAW: THE LIFE AND STRANGE DEATH OF BOBBY FULLER from Kicks Books – pick up the book and all Norton releases on Bobby Fuller and their El Paso Rock & Roll series – now ten volumes deep and documenting for the first time the incredible rock n' roll scene in the Southwest! Andy Shernoff & the Norton All Stars Dictators mastermind strikes with his catalogue of Dictators anthems, backed by his fanclub—Deke Dickerson, Brian Hurd, and Josh Styles! The A-Bones latest release EARS WIDE SHUT was recorded live on Superbowl Sunday and was received with reviews like "The guitars sound like The Stooges trying to teach The Sonics how to play Chuck Berry, and the sax sounds like it's on probation after being arrested for selling stuff off the back of a truck." The A-Bones have just returned from their second tour of Japan and now bring their ruckus back home to scenic Brookyn! Daddy Long Legs The most blueswailing combo in the world- vocalist/harmonica blower Brian Hurd, guitarist Murat Akturk, and drummer Josh Styles have spent a record-breaking year storming across North America and blazing through Europe several times. The band is recording a new album and will be blasting through their intense catalog of fan favorites, plus wild surprises. Get ready to SWEAT! MIRIAM & NOBODY'S BABIES The title of the debut album by A-Bones drummer Miriam is NOBODY’S BABY and it was produced and recorded by Brookyn’s legendary Sam Elwitt. The collection of stormy lost ballads hit the coveted #1 Most Played record slot at WFMU and is making noise in the press. The album was recorded with Sam on all instruments and Miriam on vocals. Now Nobody’s Babies, the band, has hatched, with David Lindsay (drums), Justina Davies (percussion), Matt Fiveash (bass), and Alec Higgins added to bring the recorded sound around! Bloodshot Bill Canada’s one man gang makes a triumphant return to the Bell House with a new album SHOOK SHAKE and a brand new holiday single! Bloodshot Bill makes this special stop to celebrate with the gang—all in the midst of a world tour that has taken him to a nighteries across the globe. He is now topping the festivak scenes and making big noise wherever he roams! Kicks Books celebrates its 5th anniversary Friday and Saturday night- be sure to pick up all of the hip pocket paperbacks plus the new Bobby Fuller bio I FOUGHT THE LAW! Click image to view film trailer! Neil’s father, Gene Norman, head of the L.A.-based GNP Crescendo label, signed, financed, promoted and controlled the Seeds’ catalog and music publishing. by Randell Fuller & Miriam Linna. Kicks Books is thrilled to announce the publication of I FOUGHT THE LAW! Bobby Fuller’s brother (and bandmate) tells all he knows in this long awaited first authorized biography of Texas legend Bobby Fuller, whose death by gasoline in 1966 remains a puzzle. A coterie of original players in the story are set to read, tell stories and field questions at the library! Meet & greet /signing to follow! Pick up the book and all Kicks titles at this special night out at historic Jefferson Market Library- the site of the old Women’s Prison Court House! Miriam + NObody's Babies Bell House Oct 10 + new reviews and news! NOBODY’S BABY is the title of the debut album by A-Bones drummer Miriam, produced and recorded by Brookyn’s legendary Sam Elwitt. 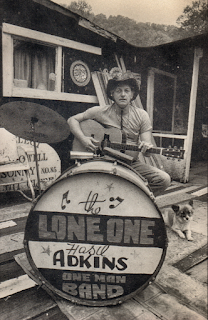 Now, the studio recordings of stormy lost ballads comes alive at the Bell House October 10! The long player features a dozen lost diamonds that the pair deemed too cool to go forgotten, including the soaring signature title track, plus an unreleased 1965 Neil Young demo (inked for Cher) -- all cut with more than a nod to the production styles of Andrew Loog Oldham and Jack Nitzsche. The album was recorded with Sam on all instruments and Miriam on all vocals, with a big studio sound – there was no inkling that they would be called upon to deliver the songs in person. That, however, is exactly what happened, and Nobody’s Babies, the band, was hatched, with David Lindsay (drums), Justina Davies (percussion), Matt Fiveash (bass), and Alec Higgins (keyboards) joining Sam on guitar to blaze through a three date Canadian hazing and a crazed NYC debut last month. Bruce Bennett of the A-Bones will also be playing guitar at this Bell House blast. Join Miriam and Nobody’s Babies alongside west coast luminaries the Muffs, who are touring with their new CD on Burger Records, and the Upset, featuring members of the Vivian Girls and Hole, who are also touring with a new album. BROOKLYN VEGAN SAYS! Click the Vegan link for show info, vids and news about Nobody's Babies opening for the Muffs at the Bell House! NOBODY'S BABY HITS NUMBER ONE AT WFMU! HUFFINGTON POST'S HOLLY CARA PRICE DIGS "BABY"! Click to read Holly Cara Price's story! PLEASE KILL ME REPORTS FROM THE BOWERY! KRIS NEEDS SPEAKS! When SHINDIG's Kris Needs said he dug the album, we felt glad all over! SHEILA B. DIGS NOBODY'S BABY! CHA-CHA-CHARMING INTERVIEW! Sheila B, like Diane G at Bowery Electric, Glynis Ward at Crayons To Perfume, Debbie D. at Ichiban and Holly Cara Price at Huffington Post were the first people to go ape over NOBODY'S BABY-- THANK YOU LADIES!!! MIRIAM IS A "CRAYONS TO PERFUME GIRL"
Click to read Crayons/Ichiban story! CRAYONS TO PERFUME 'S GLYNIS WARD SPEAKS! WFMU'S Ichiban columnist, DJ Glynis Ward digs NOBODY'S BABY! Thank you to top dolls Glynis and Ichiban's excitable and exciting hostess Debbie D! THE WIRE DIGS "BABY" - BYRON COLEY AT THE WHEEL! DAN FERGUSON CLICKS BABY AS A HIT PICK! Nobody's Baby teeshirt is here! The recently departed Gerry Goffin would be flippin’ in his grave if he could give a whiff to the solo debut from A-Bones drummer Miriam Linna. The Brill Building sound comes alive on this 12-track outing of 1960s-styled, ear-pleasing girl pop & roll. As Ms. Linna herself describes, “This album is a collection of personal favorites from the mid-sixties (primarily) featuring unheralded, broody monsters from bubbling-unders (and overs) - we even recorded an original heart-buster which we hope you dig the most. Somewhere along the line, a gust of wind took off with my last name and I became a one-name person, like Cher. Or Rasputin, for that matter.” What began as Miriam cutting a single track with studio ace Sam Elwitt soon after took on a life of its own resulting in the foot-longer called Nobody’s Baby. So here we have Miriam dipping into the catalogues of a wide ranging collection of cool cats from Gene Clark (“So You Say You Lost Your Baby”) to Neil Young (“There Goes My Babe”) to Tim Buckley (“It Happens Every Time”) to the Ramones (“Questioningly”) to Bobby Darin (“Not For Me”) and delivering pure ear candy in the process. The album features Miriam on all vocals with Elwitt handling just about all the instruments. It has this writer hoping there will be more from where this came from. HOWARD THOMPSON GOES ALL OUT FOR NOBODY'S BABY! NOBODY'S BABY hits #1 this week at WPKN with DJ Howard Thompson calling the shots! Last time this happened the Rolling Stones got a call from Ed Sullivan. Or something like that! 'Twas the Wylde Scot LINDSAY HUTTON of NEXT BIG THING fame who heaped H.T. and everyone within a 40 kilometer radius of wherever he roamed to ED-397 (a/k/a NOBODY'S BABY). Thank you Lindsay and thank you Howard! Sunday night brought in the 40th Anniversary of the Ramones first show on the Bowery-- at (where else) the BOWERY ELECTRIC, located just a few steps from where the boys first blew our gourds at CBGB's. Diane Gentile slated Miriam and Sam to the tribute, where they performed "QUESTIONINGLY" from the NOBODY'S BABY album. All proceeds from the show went to LOVE HOPE STRENGTH! STEVE TERRELL • BIG ENCHILADA DIGS IT! Nobody’s Baby by Miriam. That’s right, just one name, like Cher or Madonna. Or Winger, for that matter. This is Miriam’s first solo album, and it’s a gem. If you’re expecting the same high-intensity, raucous ’n’ roll you find with The A-Bones, you won’t get it on Nobody’s Baby. Instead, this album reminds me of two previous records, classy efforts both, in the Norton catalog: Dangerous Game, the 2007 “comeback” album by Mary Weiss, lead singer of The Shangri-Las, and All or Nothing by La La Brooks, who used to sing with The Crystals. Like those older albums, Nobody’s Baby is a contemporary take on the classic early- to mid-’60s girl-group sound — an adult update on the teen yearning and, yes, angst of that golden period. Linna draws from a wide variety of songwriters, including Jeff Barry (who, with partner Ellie Greenwich, wrote “Leader of the Pack,” “Chapel of Love,” hits for The Ronettes, and dozens more songs — many, you’ve probably never heard of), Tim Buckley, Bobby Darin, Gene Clark (formerly of The Byrds), Neil Young (an early, obscure tune called “There Goes My Babe”), and The Ramones (though Miriam’s version of “Questioningly” sounds more like The Chiffons than anyone who ever played CBGBs). Currently, my favorite on Nobody’s Baby is “Walking Down the Street.” It’s the closest thing to a real rocker on the album. I thought this might be an obscure Shangri-Las B-side, but it was originally done by a Pretty Things offshoot band called The Electric Banana. norton records inc. Simple theme. Theme images by gaffera. Powered by Blogger.